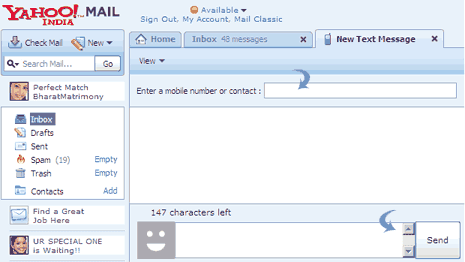 How to send free SMS from Yahoo Mail to any mobile phone? 1. Login into Yahoo Mail & click “New Yahoo Mail” link at top right. 2. Your Yahoo Mail inbox will load with a new look. Now press t key. 3. Select your country and form to send text message will load in your Yahoo Mail inbox. hi my friend how to send sms to malaysia…? How can we send Free SMS With out Showing my number And Number Show Like LM- My Orgization Name . Not all countries… Many middle east countries are not listed at all. I want send sms on mobile. i want to send msg to UAE why i can not? hi friends how r u? ‘ m fine good nit. tc. You can also use websites, such as txtpoint.net to send and receive free sms text messages to any provider! I see images of my friends whenever they are offline and on SMS. how can i do the same? Maybe try sending with yahoo messenger? i want to send sms to mobile phone….by using internet. but how? Hi, how r U ? hy! I am usman from pakistan how can send picture to mobile from internet? how can send picture to mobile from internet? could not send msg to a friend in usa. I want to send sms on yahoo ,please tell me how? Hi i’m Sekar. Its very easy to send sms to yahoo mail to others. i genuinely love your posting way, very exciting. impatient to looked over much of your own posts, have a great day! Sorry but not working in the UK. There is no option to send a text anywhere in the programme or in the Mail Plus option. Maybe one day……. how to sent SMS from Macedonia? is it have charge to send sms to mobile fhone?? Just wondering if anyone has tried freesmstexts.com If so is it actually free to send sms? Thanks in advance. I think that’s really good if you have a yahoo email address if you don’t you might want to try freesmsworld.co.uk that’s the site I use. it really works… thanx dude! Send 140 character Free SMS Across India with smswala.co.in An excellent site for sending reliable SMS, Wallpapers, movie reviews, music reviews, chat. I type T key but nothing shows to my account. How about some of us that our country does not appear on the country selection page(Nigeria),what do we do? How do I text groups repeatedly without picking group from contacts again. Try textyourbuddy.com You can create groups there, and send out multiple sms at once.